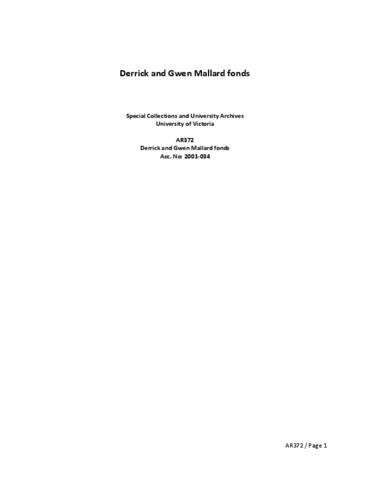 Fonds consists of records related to the environmental activism and activities of Gwen and Derrick Mallard. The fonds is arranged in 12 series: Alpha-numeric series (A1-W27), 1959-93; Derrick Mallard series, 1947-2001; Gwen Mallard series, 1968-97; B.C. Environmental Associations, 1972-2000; BC Environmental newsletters, 1970-2000; Community Associations, 1990-2000; Capital Regional District, 1990-2000; Foundations, 1994-2000; Issues, 1973-2000; Land preservation, 1990-2000; Awards, 1992-2001; and Promotional displays and graphic materials, [1972-1996]. The Alpha-Numeric system was established by Derrick Mallard in the early years of his environmental work. The files, the majority of which were un-filed, constitute the Mallards’ research materials relating to their C.A.S.E. work. These have been arranged in series reflecting the subject groupings of his early alpha-numeric system. Administrative files relating to C.A.S.E. have been arranged in the B.C. Environmental Associations series. Approximately 300 reports and publications have been transferred to Special Collections, and cataloged as the Derrick Mallard Collection. They are on a wide variety of environmental subjects, including: water, sewage, transportation, parks, farming, noise, fishing, endangered species and global issues. Other materials include slides, photographs, VHS videocassettes, and audio cassettes.